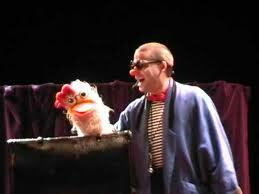 Ruskus Patruskus with his old friend, Pipo Corocó. Traspatràs is a show that complements the educational task on road safety carried out by many local police officers all across Catalonia. This play conveys education messages on road safety and civility by using magic, music, clowning, and balloon figures. In fact, the primary objective of the show is to arouse student’s interest in road safety. Traspatràs also reinforces some important aspects of prevention and civility. Ruskus uses magic to teach road safety. 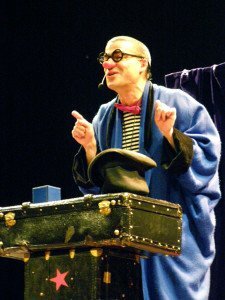 The play Traspatràs is available in two versions: one for children of kindergarten, 1st, and 2nd-grade, and another one for 3rd to 6th-grade students. Author and performer: Ruskus Patruskus. Play’s genre and subject: children’s show on road safety. – Kindergarten, 1st, and 2nd-grade: 35 min. – 3rd to 6th-grade: 45 min. Performing space: any place with a minimum surface area of 3 x 4 m.
Sound and equipment: a 20 W battery-powered amplifier is included. There is no need of microphone, neither platform nor special lighting. In performances with 80 children or more, a 250 W PA system with wireless microphone is provided. Set up and strike time: set up 45 min, strike 25 min. (Performances with PA system: set up 1 h, strike 35 min).